For optimal ORR performance, different doping patterns should be achieved on different carbon materials: gray (carbon), pink (boron), blue (nitrogen) and white (hydrogen). As they offer good conductivity and mechanical properties, well-designed carbon materials with high performance in ORR is key to this. As researcher Xiaolong Zou told Materials Today, “The development of high-efficiency catalysts for cathodic oxygen reduction reaction is critical for large-scale applications of the proton-exchange membrane fuel cells”. As reported in the journal Nanoscale [Zou et. al. Nanoscale (2017) DOI: 10.1039/C7NR08061A], using computer simulations the team examined why graphene nanoribbons and CNTs modified with nitrogen and/or boron are too slow and how this could be improved. The doping of conductive nanotubes or nanoribbons alters the characteristics of their chemical bonding, which helps them to be function as cathodes in proton-exchange membrane fuel cells. In a standard fuel cell, anodes draw in hydrogen fuel and then separate it into protons and electrons. As the negative electrons flow out to become usable current, the positive protons are pulled into the cathode to recombine with returning electrons and oxygen to produce water. It was found that ultrathin CNTs with a relatively high concentration of nitrogen dopant performed most effectively due to the interaction between the dopants and also the distortion of chemical bonds. Nanotubes are better than nanoribbons in this because of their curvature, which distorts chemical bonds around their edge and offers easier binding. They found that ultrathin nanotubes with a radius between 7 and 10 angstroms was ideal. 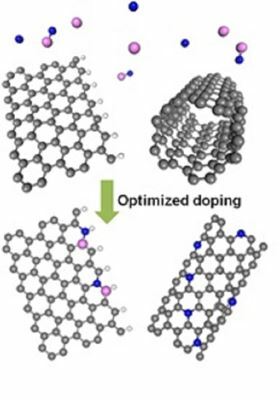 It was also demonstrated that co-doping graphene nanoribbons with abundant edges with nitrogen and boron show comparable performance as CNTs for absorbing oxygen. Here, oxygen finds a double-bonding opportunity as they can attach directly to positively charged boron-doped sites. As Boris Yakobson said "While doped nanotubes show good promise, the best performance can probably be achieved at the nanoribbon zigzag edges where nitrogen substitution can expose the so-called pyridinic nitrogen, which has known catalytic activity”. The team now hope to develop new tools to investigate the electrochemical processes in real time and the nanoscale, as well as to better engineer the interaction between dopants and defects in carbon materials to improve the performance.